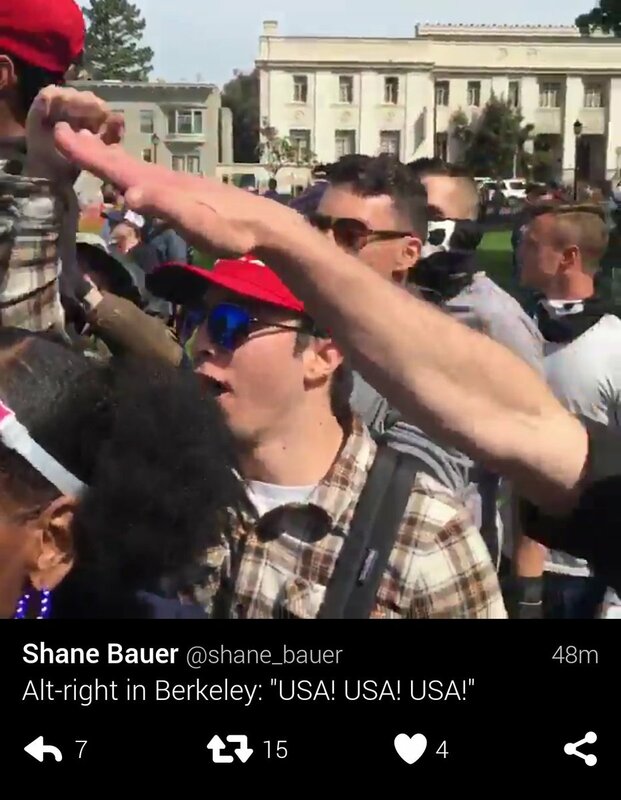 This photo shows Donald Trump supporters in Berkeley, California, USA, bringing the nazi salute on 15 April 2017. The Trump supporters violently attacked anti-fascist counter-demonstrators. Nathan Damigo is a leading white supremacist and a student at CSU Stanislaus in Turlock, CA. He spent 5 years in prison for carrying out a violent hate crime and has been documented putting up neo-Nazi stickers at his college. On Saturday, April 15th, he attacked and beat up someone during the pro-Trump rally in Berkeley, CA: here. From the National Mall in Washington, D.C. to Fairbanks, Alaska, to the Mar-a-Lago Resort in West Palm Beach, Florida, Americans are taking to the streets on Saturday to send a clear message to President Donald Trump: “Release your tax returns”: here. Fear Grows as Armed Trump Supporters Escalate Threats Against Progressives. “There are a bunch of people on the Internet who are waiting for someone to tell them it’s okay to start shooting at you.” By Rick Perlstein: here. Jeffrey Lord, the indefatigable defender of President Trump whose advocacy turned him into an unlikely political celebrity, was fired by CNN on Thursday after a Twitter exchange in which he evoked the Nazi salute Sieg Heil. Actually, CNN’s Jeffrey Lord Has Been ‘Indefensible’ For A While. If CNN has a problem with racism, it should have ousted Lord a long time ago: here. The boys in a Wisconsin high school class appear to have posed in a Nazi salute in a junior prom photo, the Baraboo News Republic reported: here. This entry was posted in Economic, social, trade union, etc., Racism and anti-racism and tagged Donald Trump, nazis by petrel41. Bookmark the permalink.